Home › Prophecies Fulfilled by Jesus › The Second Arrival of the Messiah › Israel in the Last Days › All Israel will be saved › The Final Blood Moon of September 28, 2015, Arrives; Now What? The Final Blood Moon of September 28, 2015, Arrives; Now What? As we approach the arrival of the final of four blood moons that will take place on September 28, 2015, the specifics of what this event will mean, still seems unclear to many people. First, this fourth blood moon will not be the end of the world. If you are expecting the Apocalypse to begin at the moment the blood moon reaches its peak at 10:47 Eastern Time in the United States, this will not happen. The tetrad of four blood moons which have taken place over the past 500 years, have concerned the nation of Israel and her ability to exist in the Last Days. The final four blood moons that we have observed in 2014-2015, have all taken place on important Jewish Feast days; Passover and Tabernacles. The importance of this final blood moon, must also concern Israel and an event that will drastically effect her continuing ability to exist as a nation. Many of us who study Bible Prophecy were hoping that the advent of these final four blood moons, the last of which, occurring in September, 2015, during the time that the Feasts of Trumpets, Atonement, and Tabernacles all took place, would also bring the return of Jesus—at the Rapture. Clearly, this was not the time that the Lord has chosen to return, as the Feast of Trumpets has now come and gone and the Lord has not returned for His church. This is why it is important to not set dates for the Rapture. It is my personal belief that when Jesus does come again, it very likely will be during the Feast of Trumpets. The reason that I hold this view is that Jesus was very careful to fulfill each of the first four Feasts, on the specific days, and in the precise manner that each of these feasts should be fulfilled. We should not lose our hope of Jesus’ soon return, for today we are closer to His arrival than we have ever been before. Jesus is following a carefully detailed schedule for all the events of our redemption and He will only come when the time is perfect. We must remember that a primary reason for Jesus to wait as long as He has already, is so that more people have the opportunity to hear about Him, repent of their sins, receive Him as their Savior, and be ready for the moment when does He comes for all those who love Him. It is very possible that this fourth blood moon will be the signal to Israel that the seven year Tribulation will begin soon. All of the former occurrences of four blood moons, during the past 500 years, were signals of important events that God was accomplishing, concerning the gathering of the Jews back into their own land once again. The Return of the Jews to Palestine and the rebirth of Israel as a nation, was an absolute requirement for the accomplishment of all the final events of all Bible prophecy. All three of the past tetrads of four blood moons, concerned this one event. If we examine the events that surround the past occurrences of four blood moons in the past 500 years, we notice that important events took place, either just prior to, or immediately after, the presence of a blood moon. In 1492, Columbus discovered America, which made it possible for Israel to exist as a nation once again, in 1948. Had the United States not began as a nation, it is likely that Israel would not have been able to come back into the land after being scattered over the face of the earth during the past 2,000 years. We notice that the blood moon that took place during that time, did not happen in 1492, but during the period of 1493-1494. The same is true at the second Tetrad of blood moons. Israel became a nation in 1948, yet the blood moon did not come until 1949. It is possible and highly probable, that the real significance of this last blood moon in September 2015, will not be observed until after this event took place. On September 13, 2015, the beginning of Rosh Hashanah, Palestinian young men took up stones against Jews who came to the Temple Mount to pray. When Israeli police came to arrest these young men, they fled into the Al Aqsa Mosque for protection. Israeli soldiers discovered that Palestinians were storing bomb making material at the Mosque and immediately closed the Temple Mount site. There were several protests by Palestinian leaders and the King of Jordan. Since that day, there has been a marked increase in attacks by Palestinians against Jews who are living in Jerusalem. Today, October 16, 2015, Palestinians have greatly escalated their violence against Jews in Jerusalem. It is certain that this increase in violence will necessitate swift action by Israeli Military, in order to defend and protect their citizens. This will infuriate other Palestinians and likely cause an even of important significance in Israel. It is possible that Israel will be forced to use their military and weaponry to prevent their destruction and this could lead to a new war between Israel and surrounding Arab nations. These are the type of events that may have been signaled by the occurrence of the fourth blood moon in September, 2015. If there is a new war or the possibility of war between Israel and Arab nations, there would be a heightened need for peace. We know that the seven year Tribulation begins with a peace plan of seven years between Israel and many other nations. The Tribulation begins with the opening of the first seal in Revelation, chapter 6. For the final three and one-half years, God will pour out His wrath on the kingdom of the antichrist, and those who worship him. The book of Revelation describes two-thirds of the people of earth who will perish during the completion of seven seals, seven trumpets, and seven bowl judgments. At Revelation, chapter 19, Jesus will return to earth, with His church that has been with Him in heaven during the past seven years. Jesus will arrive at the Mount of Olives and travel north to the Valley of Megiddo, where the antichrist and the armies of the world will be assembled to fight Jesus and kill Him. Jesus will simply speak and all the armies of the antichrist will be destroyed. Jesus will begin his judgement of the nations, as described in Matthew 25, separating the sheep from the goats. Those who assisted Israel during the Great Tribulation will go into the one thousand year reign of Jesus on the earth. Those nations which persecuted Israel during the Great Tribulation, will be forbidden to enter His new kingdom. For one thousand years, Jesus will rule over the earth as King and there will finally be peace on the earth. No one will hurt or kill, or take advantage of anyone during that time. People will dwell in a perfect environment and live out long and prosperous lives, in the manner that God intended for us. At the end of the one thousand years, satan, who has been held in chains during this time, will be released to gather all those who were in secret rebellion to Jesus rulership during the one thousand years of His reign. All these, the devil, and everyone who worships him, will be cast into the Lake of Fire, where they will remain forever. Jesus will destroy the present universe and then, as all of us who love Him watch; He will speak a new universe into existence. And then, all those who love the Lord, will be with Him forever. There will be no more tears, no more death, all sickness and suffering will be banished from human life, forever. In these events, we see the importance of paying attention to the signs in the heavens that the Lord has given to us, which may concern the return of Jesus, the beginning of the seven year Tribulation, and all the events that are described by the Book of Revelation. 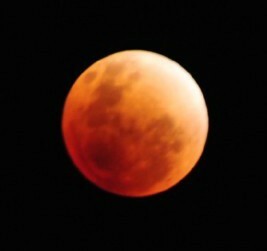 These blood moon’s concern Israel, and what concerns Israel, effects the entire world. This fourth blood moon is not the end of the world, but it many be a signal that the events described in the Book of Revelation, which concern Israel and the world, are about to begin. The text from the above article is from the book: “Dead or Alive, The Final Events of Earth,” by Robert Clifton Robinson.